The Forgotten Ones gives the world a window into the lives of 'left-over' Vietnamese refugees in the Philippines. These refugees include both 'boat people', who risked their lives to escape Vietnam, and Amerasians, the children of American fathers and Vietnamese mothers. Both groups have gotten caught in bureaucratic limbo after being denied permission to immigrate to a third country. Most of them have been given permission to stay in the Philippines but have limited rights to establish viable lives. Brian Doan's panoramic black-and-white photos capture the bleak existence of The Forgotten Ones: sadness, separation, boredom, harassment, discrimination, sickness, poverty, despair, dementia, and death - and reveals a ray of hope: determination, prayers, hope, faith, and thankfulness. Despite the loss of opportunities and the loss of dignity, The Forgotten Ones survive and persist. 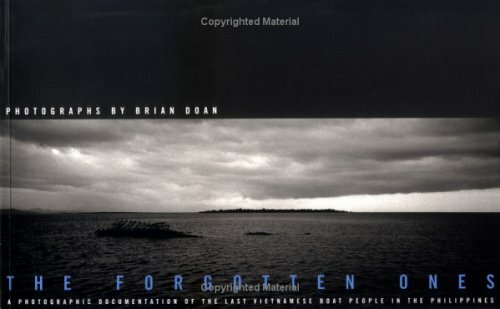 The Forgotten Ones is only one chapter in the worldwide story of the Vietnamese Diaspora, which began in late April 1975 with the collapse of South Vietnam. Since the Diaspora began, over a million Vietnamese have left their homeland in search of Freedom. Several hundred thousand died without reaching their goal.